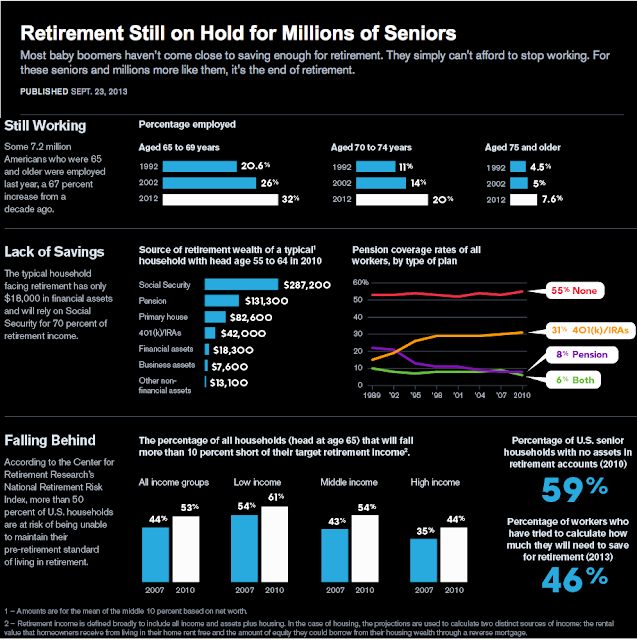 Relentless Financial Improvement: Bloomberg retirement infographic: will you be able to retire? Bloomberg retirement infographic: will you be able to retire? Millions of baby boomers, individuals born between the years 1946 to 1964 (now ages 49 to 67 years old) can’t afford to stop working because they haven’t come close to saving enough for retirement. The facts are sobering, especially this one: the typical household facing retirement will rely on Social Security for 70% of their retirement income. Bloomberg has also posted an article about a 77 year old man whose lack of proper retirement planning has forced him to continue working two jobs well past the average retirement age, just to scrape by. Have you started thinking about retirement yet? Get started with my series on investing here.